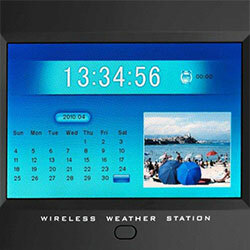 The Digital Weather Station with picture frame viewer combines two digital devices in one system together. The Digital Weather Station is made of a high quality 7 inch colour display which replaces a full digital picture frame (digiframe). You can view and plot digital images as well as play slide-shows. These images can be stored in the integrated memory or on memory cards. All standard memory cards can be used for this digital weather station. Another function is a weather station with a built-in barometer with a data display. Coloured symbols display weather. Graphics for all parameters will be saved on memory card, even phases of the moon, sunset and sunrise can be retrieved and are adjustable for more than 300 cities. The station contains an outdoor sensor which sends air humidity data and temperature to the station. Room climate will be controlled via thermo-hygro sensor. The Digital Weather Station with picture frame viewer contains a remote control which can be used to regulate and modify all functions. Power supply is provided by a cable plug and the data is readable even in the dark. With this digital weather station you can always look at your favourite pictures and be well informed about time, temperature and the current weather situation. On a sideboard or night table this practical radio controlled weather station can be a digital picture frame, radio controlled clock and alarm clock. All you need is to put a memory card with pictures and photos into the SD car reader. The elegant black picture frame will show the digital picture collection immediately in a good resolution (800 x 480 pixels) on the 7-inch screen. The digital weather station has got a photo playback and dia-show modus. 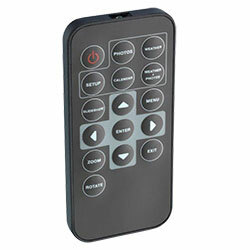 Just one touch of a button on the check card sized remote control is enough to get to the next picture. As an option you can set the automatic picture change. The reliable weather forecast is with symbols, maximum and minimum values. Outdoor temperature and humidity data will be sent to the station via the enclosed outdoor sensor (operating range 30 m). The clearly arranged display provides a detailed description with exact values (including maximum and minimum values) and significant weather symbols. Based on the recent air pressure values of the last 24 hours, the current weather forecast shows if the weather is going to be sunny, cloudy, stormy or rainy. This all-rounder gets completed by a radio controlled weather station with display of date and alarm clock. If you have any questions about these products, please contact us: UK customers +44(0) 23 809 870 30 / US customers +1-410-387-7703. An overview of all weather stations can be found here: weather stations Our technicians and engineers will gladly give you advice on this digital weather station and all other products in the field of measuring instruments, regulation and control and scales. If you want to use additional sensors (max. 3) for other rooms, for example the bedroom or children’s room, you can connect them directly with the weather station. It is possible to control measured data of all rooms. The weather forecast will be made by sensor 1 when other sensors are adapted. Basis for weather forecast will be the data from sensor 1.